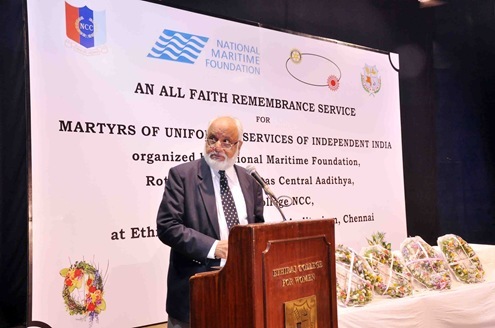 ‘All Faith Memorial Service’ for Martyrs of Uniformed Services of Independent India was jointly conducted by the National Maritime Foundation, Rotary club of Madras Central Aadithya and Ethiraj College for Women at Chennai on December 14, 2010. Here is the Press Release on the All Faith Remembrance Service held at Ethiraj College for women that was attended by a large cross-section of the society including members of the diplomatic corps. “All Faith Remembrance Service” to pay homage to the Martyrs of all Uniformed Services of Independent India. After the cessation of World War I, the miseries of innumerable deaths and incalculable destruction of properties also came to an end. Relieved of the hardships endured through the years, people decided to celebrate the end of the horrific war. Thus they came up with the idea of ‘Armistice Day’ which was to be celebrated on the 11 November each year all over the world. The word Armistice, derived from Latin means truce or stoppage of war. Legend has it that around Armistice Day people noticed a large number of poppy plants with blooming flowers over the burial grounds of the soldiers who had laid down their lives during the war. Hence, the day was also called ‘Poppy Day’. On this day token paper poppies were sold to the public and the amount so collected was used for the welfare of the war veterans and their families. Against this backdrop, sixty three years into our Independence it would be most appropriate to pay homage to martyrs of all categories of personnel in uniform including the Armed Forces, Para military forces, Police etc., who during their life times had braved the inhospitable conditions of the deserts, glaciers, air and seas, as well as in every village, town and country for 24 X 7 throughout the year so as to enable their countrymen to sleep comfortably in their homes, and then made the Supreme Sacrifice of their lives yesterday for the sake of our today. 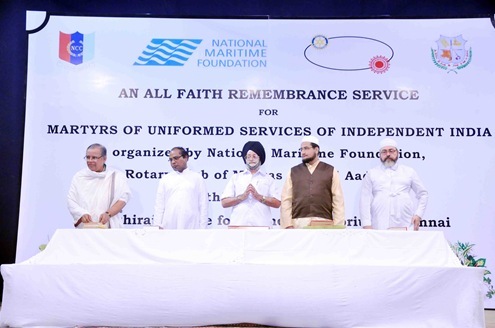 The Chennai Chapter of the National Maritime Foundation, in association with the University of Madras and the Rotary Club of Madras Central Aadithya, conducted for the first time ever in our country, “An All Faith Remembrance Service” to pay homage to the Martyrs of all Uniformed Services of Independent India. The Remembrance Service was conducted in the Auditorium of Ethiraj College for Women, Egmore, Chennai on Tuesday 14th December. 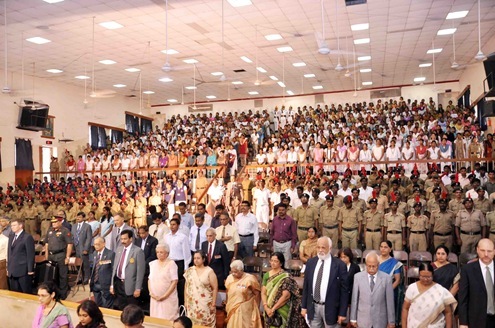 His Highness, Muhammad Abdul Ali, Nawab of Arcot was the Chief Guest at the function with an audience of NCC cadets in uniform, college students, serving and retired members of the Armed Forces, Rotarians, and elite of the city. Consul Generals of US, Russia and Australia were amongst the distinguished members present. In his introductory remarks, Commodore S Shekhar, Regional Director of the National Maritime Foundation, brought out that in today’s world, any one who contributes to make our nation great is a patriot. This includes Lawyers, Doctors, Engineers, Accountants, Software engineers, masons, plumbers, electricians, shopkeepers – the list is endless. But there was one significant difference. All these were professions. There are only two “Callings”. One was the “call” to serve God. And, the other the “call” to be prepared to pay the ultimate sacrifice for the country, by laying down one’s life. In today’s unique and unprecedented ceremony, it was for perhaps the first time, that such an august gathering, representing all our major faiths, and from all walks of life, transcending generations, genders and professions, has assembled to pay homage to the martyrs of the uniformed services of independent India. Five Sacred texts, the Bhagavad Gita, the Bible, the Koran, the Guru Granth Sahib and the Zend Avesta, were brought in ceremonial procession into the Auditorium and placed at a specially created altar. Eminent representatives of the five faiths then read out appropriate extracts from their respective texts. Distinguished members of the audience, representing various organisations thereafter placed wreaths at the Altar. Collective homage of some five hundred members of the audience was paid with Army buglers sounding the “Last Post” at which two minutes’ silence was observed in memory of the martyrs of uniformed services of Independent India. Speaking on the occasion, the Nawab of Arcot, emphasized the exemplary role of the Indian Armed Forces, who had not only distinguished themselves by their valour on the battle field on many occasions of conflict since Independence, but had consistently demonstrated that they were beyond the evils of sectarian politics and religious fundamentalism which had begun to increasingly manifest themselves in our social polity. The Nawab reiterated that the tenets of Islam which held that there was but one God, was fundamental to the philosophies of all religions. He decried that various vested interests were conspiring to create fissures within various sectors of our society and exhorted the audience to believe in the Creator alone and not be misled by misguided creations. He expressed the conviction, that as long as the Indian Armed Forces continued to function the way they have been doing, no force on earth can destroy the integrity and sovereignty of our nation. Others who spoke included Lieutenant General Sundara Rao, Chairman of the Armed Forces Veteran Officers’ Association, Rotarian Olivannan, District Governor, Rotary District 3230, and Dr Thavamani, Principal, Ethiraj College for Women. Later, speaking to newsmen, Commodore Shekhar stated that it was the intention of the National Maritime Foundation, Rotary Club of Madras Central Aadithya to make the All Faith Memorial Service a regular annual feature, as it had served to bring together large sections of our society to recognize the sacrifices made by our Armed Forces, which in turn had energised and motivated the student community. Prince Mohammed Ali, Nawab of Arcot.